Scarborough & Rouge Hospital, Toronto, ON, Canada. Presented at EWMA 2017. Proceedings of the Annual European Wound Management Association Conference; 2017 May 3-5; Amsterdam, The Netherlands. Obesity increases a person’s susceptibility to infections due to a combination of factors including increased bacterial colonization, skin folds which promote bacterial growth, and insufficient wound cleaning.1 Detecting bacteria based on clinical signs and symptoms is difficult as bacteria are invisible to the naked eye. 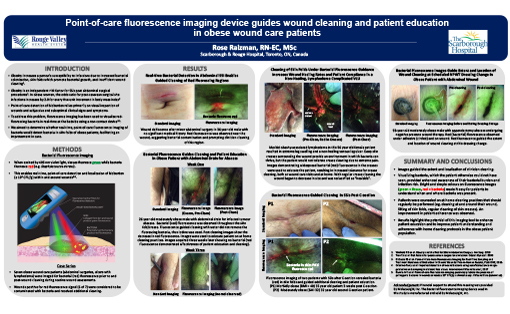 We aimed to determine whether real-time, point-of-care fluorescence imaging of bacteria2 would detect bacteria in skin folds, facilitating an improvement in care. 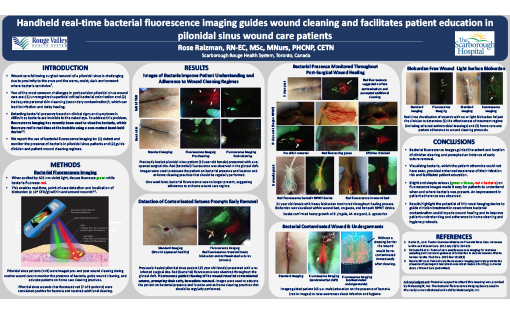 Six obese wound care patients (abdominal surgeries, ulcers with lymphedema) were imaged for bacterial (red) fluorescence prior to and post-wound cleaning during routine wound assessments. 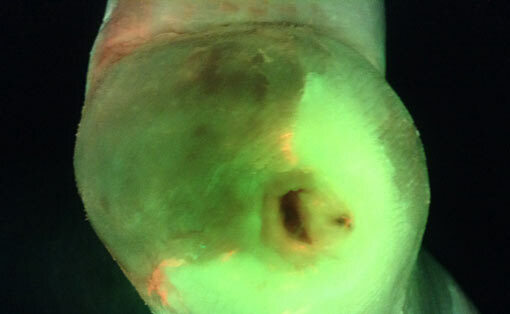 Wounds that fluoresced red (5/6) were considered positive for bacteria and received additional cleaning. 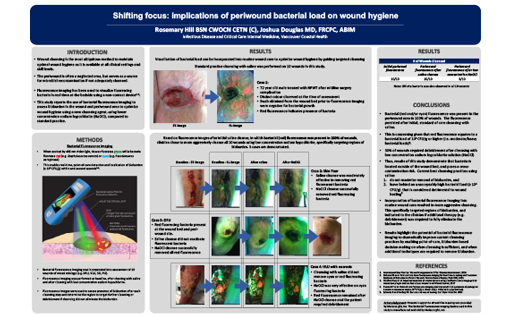 Images were used to educate patients on the presence of bacteria in skin folds near the wound and to raise awareness about infection. The bright, simple colors on fluorescence images (green = tissue, red = bacteria) simplified patient understanding of when and where bacteria was present. Patients were counseled on at-home cleaning practices that should regularly be performed (e.g. cleaning at and around the wound, lifting of skin folds). An improvement in patient adherence was observed. 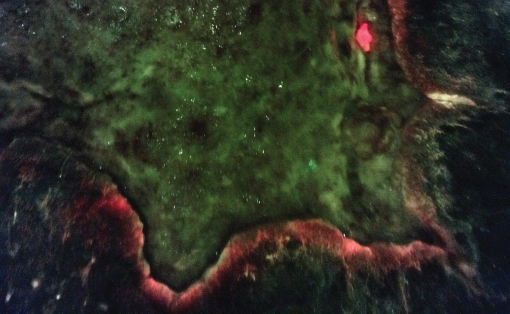 Fluorescence images revealing the presence of bacteria guided the extent and location of clinician cleaning. Visualizing bacteria, which the patient otherwise could not have seen, provided enhanced awareness of their infection risk. Results highlight the potential of this imaging tool to improve understanding and adherence to at-home cleaning protocols in the obese patient population. DaCosta RS, Kulbatski I, Lindvere-Teene L, Starr D, Blackmore K, Silver JI, Opoku J, Wu YC, Medeiros PJ, Xu W, Xu L, Wilson BC, Rosen C, Linden R. Point-of-care autofluorescence imaging for real-time sampling and treatment guidance of bioburden in chronic wounds: first-in-human results. PLOS ONE, 2015, 10(2). doi: 10.1371/journal.pone.0116623.